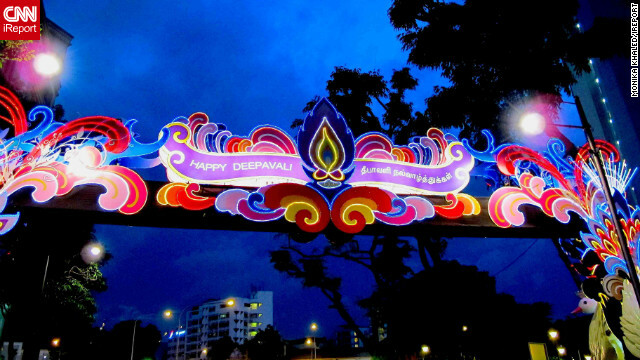 A neon sign celebrating Diwali 2012 hangs above Singapore's Little India district. Diwali, also known as the Festival of Lights, begins on November 13 and is celebrated for several days afterward by millions of Hindus across the world as one of the most important events on their spiritual calendar. The word Diwali itself means 'festival of lamps', because houses and public spaces are decorated with scores of small oil lamps in honor of the goddess Lakshmi, to whom Hindus pray to for success and wealth. Throughout the festival, families purchase new clothes and buy sweets and snacks for themselves, relatives and friends. To commemorate Diwali, we want to see your best images of the most beautiful festival lights. Send them to CNN iReport. Salahfi is derived from Latin word selfish, a smelly doggy tradition of sel fish desert dwellers, goons or saken fe al-sahra'a, within the first four hundred years after the GAWD was buried in desert sand, illegality called Mecca. Americans, goons, all, be a sals HFI, a new form of Is'Lambism, and be true goons, dump dogs, cats, aligators, wahhabi, ahmedi, suni, shie, ignorant. EVERY hINDU, FILTHY IS INVITED TO FEAST ON THEIR COW MAMAS DUNG AND GET HIGH ON THEIR COW MAMA'S URINE FREE OF CHARGE ALONG WITH hINDU FILTHY ANIMALS. hinduism, cow dung of a hindu, cow pea drinker. The statistical studies from the nineteenth century and the three CCU studies on prayer are quite consistent with the fact that humanity is wasting a huge amount of time on a procedure that simply doesn’t work. Nonetheless, faith in prayer is so pervasive and deeply rooted, you can be sure believers will continue to devise future studies in a desperate effort to confirm their beliefs.`. .
Trolling idiot. Post your garbage somewhere else. Like Al-Jazeera. Don't these heathens know that god hates them and will banish them to hell for all eternity for not accepting jesus as their lord and saviour? God loves America, not Hindu's. check out pics of "derp" and his dog, Jesus, at saladandchips.com. Have no doubt Jesus ism is nothing else but hindu Mithra ism, savior ism, labeled as Christianity, handy work of hindu Jew's, filthy secular s to justify hinduism, racism. hindu gentile, ignorant slave. Hinduhater, are you affiliated with any religion, or are you just an equal-opportunity hater? A Kira, I am a Pakistani muslim, with Punjabi Hindu run away father, I hate Hindus, Jews, obviously, and Christians, ignorant, I preach my version of Islam, truth absolute Theen GAWD, Sunni, Shia, Salafi, Ahmedis, they are all goons of Allah, denier of truth absolute GAWD, not GOD. no wait i worship three Goddesses to day because i'm helping make the life of one of Gaias children easier which is how you give offering to Gaia, and if i drink water to day their another Goddess worshiped right their. Hinduhater, you have a propensity to randomly add a space where none is required.